The appeal of Halloween’s family fun is no mystery since this autumn holiday blends elements of the harvest and the supernatural, captivating kids and adults alike. Whether it’s candy treats, clever costumes, lively parties or colorful parades, there’s something for everyone in the spectacle and revelry surrounding October 31. 1. The earliest jack-o’-lanterns were not made from pumpkins. Which vegetable was originally carved to ward off evil on Halloween? Was it the a) eggplant, b) potato, c) turnip, or d) squash? 2. Parades are held in many communities to celebrate Halloween. Where does the biggest Halloween parade in the United States take place? Is it a) New York City, b) Salem, Massachusetts, c) Chicago or d) Los Angeles? 3. Black cats are an icon of Halloween and are often associated with bad luck. However, white cats are considered unlucky in some places. According to folklore, some people in this European country consider white cats to be bad luck. Is it a) Austria, b) England, c) Sweden or d) Belgium? 4. Untold numbers of American children go trick-or-treating every year. 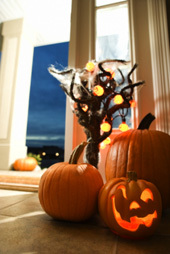 However, going door-to-door to collect candy has not always been a Halloween tradition. When did trick-or-treating first come into vogue in the U.S.? Was it the a) 1920s, b) 1940s, c) 1950s or d) 1960s? 5. Apples are more than a favorite fruit of autumn. They also are part of a traditional Halloween game – bobbing for apples. The idea of incorporating the apple into Halloween festivities stems from an ancient culture. Was it the a) Romans, b) Greeks, c) Egyptians or d) Mayans? 1. c. It’s said that the Irish were the first to make (and name) the jack-o’-lantern. They carved out turnips and placed candles within to keep evil and ghosts away from their houses. They did this on the Celtic New Year, called Samhain, which is the celebration that inspired Halloween. 2. a. New York City’s Greenwich Village Halloween Parade is the largest in the country, with crowd estimates that range up to 50,000 for participants and 2 million for spectators. 3. b. According to English folk legend, it is the white cat that brings bad luck. 4. c. Halloween celebrations have been around since the early 1900s, but trick-or-treating by costumed kids didn’t come into its own until the 1950s. The custom is said to have been brought over by Irish immigrants at the turn of the 20th century but it took a while to catch on. The growth of suburbia gave a big boost to the custom. 5. a. You can thank the Romans for giving the juicy red fruit its place among Halloween traditions. The early Halloween, Samhain, was held around the time of the Roman festival honoring Pamona, the goddess of fruit trees. Pamona was often symbolized by an apple and so the apple became synonymous with Samhain observances and, later, Halloween, with its candy apples and apple-bobbing.